Let's face it - the highlight of Easter morning is cracking into that first delicious mouthful of your prized Cadbury chocolate Easter egg. Browse our massive selection of Cadbury Easter eggs to find all your favourites, from classic Wispa, Twirl and Creme Eggs, to Dairy Milk Buttons, Mini Eggs, Roses and more. 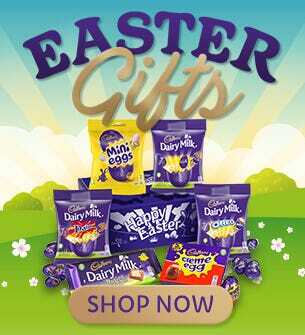 Treat the entire family to the Easter chocolate they love, with a wide range of small and large Easter eggs with a variety of flavours and fillings. Shop online for fast next-day delivery, and get your eggs delivered straight to your door.